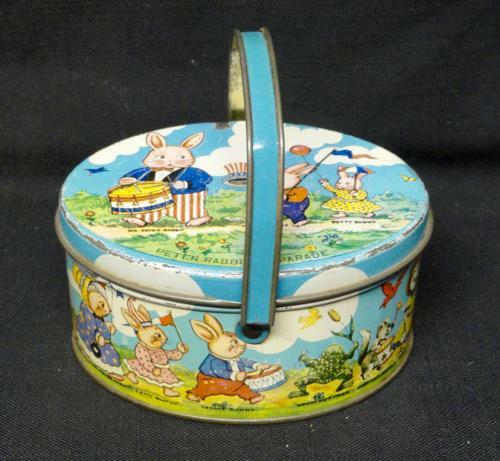 This wonderful rare and hard to find antique child's tin candy box has a hinged handle and lid and dates to the 1920's. An oval measuring 4 5/8" long x 3 1/2" wide x 2 3/8" tall. Good detailed lithographs of Peter Rabbit on Parade with Teddie and Betty on the cover. Along the entire outside are all of Peter Rabbit's friends joining in the parade. What a great antique candy tin! Condition is very good with minor paint loss and wear. Hinges and handle in great condition. Best we have ever seen.